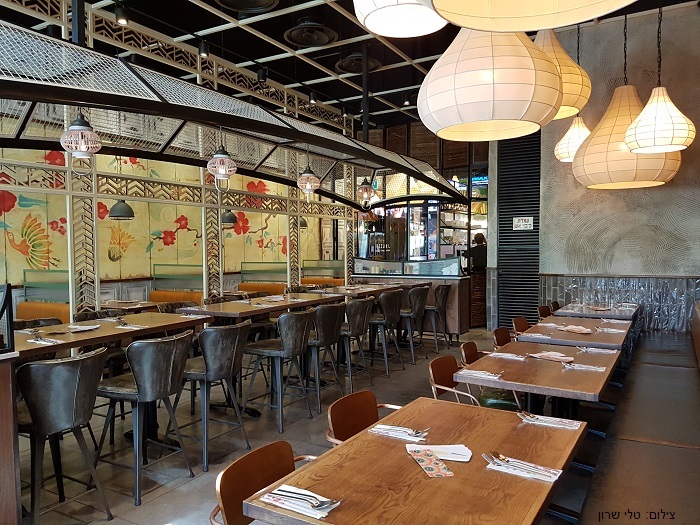 Irezumi is an Asian restaurant in Yes Planet Rishon Lezion featuring high quality oriental food created by Sawalee Eldar, the well-known Thai chef. 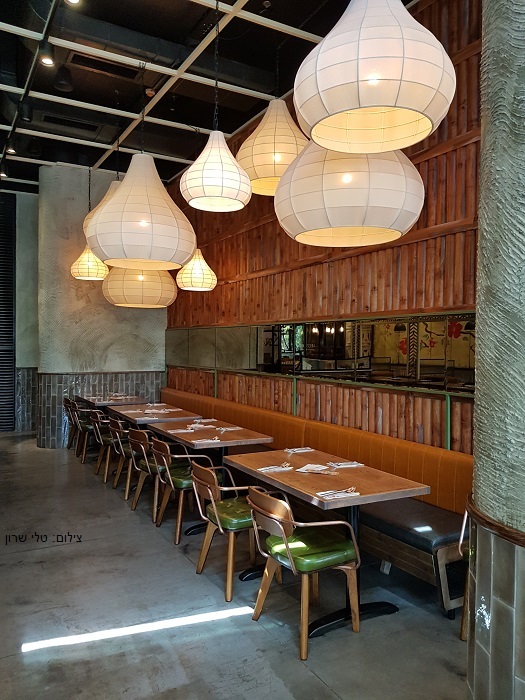 Irezumi is not a regular Asian restaurant; it serves high-quality ingredients made freshly and accurately by a team that was picked and brought here especially from Thailand’s best cooking schools. Ierzumi is located on the lake at Yes Planet Rishon Lezion. It is modernly decorated but with a touch of the orient. 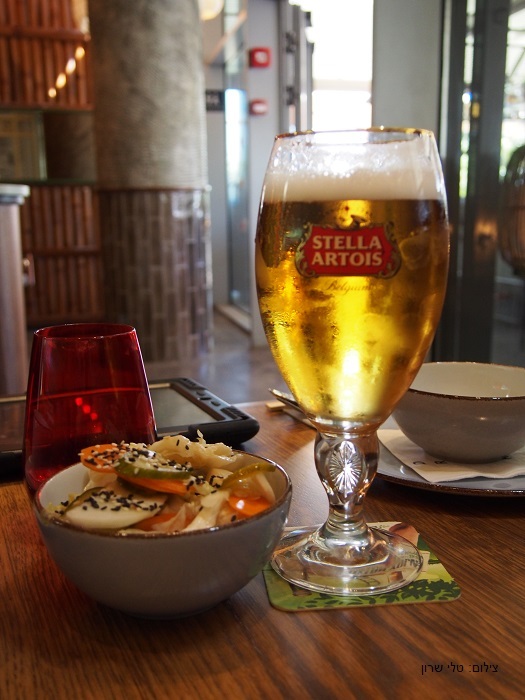 The menu features starters, soups, Pad Thai, Sushi, stir fries and fish. There are also cocktails and desserts. At lunch they are offering business deals including starter, main course, and a soft drink for 65,73 and 83 NIS. In a few weeks they will also offer a delivery service. 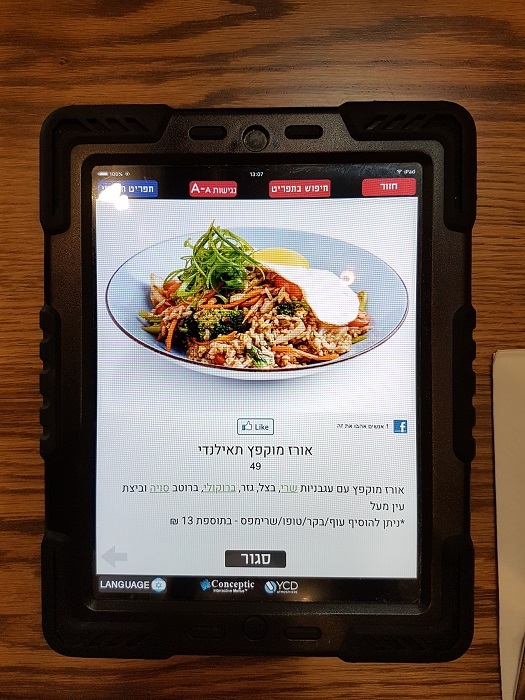 The menu is on iPad (Hebrew and English version available). There are also children meals and some non-oriental dishes for those who won’t eat Asian food. 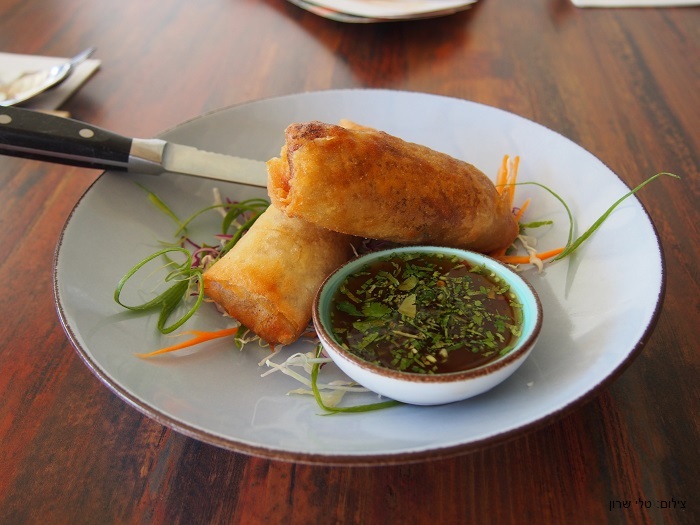 Egg-roll – Crispy pastry filled with vegetables, carrots, shitake mushrooms, cabbage and celery, served with a chili dip. Two large eggroll, the filling was somewhat merged into one taste of vegetables and the dressing was excellent. 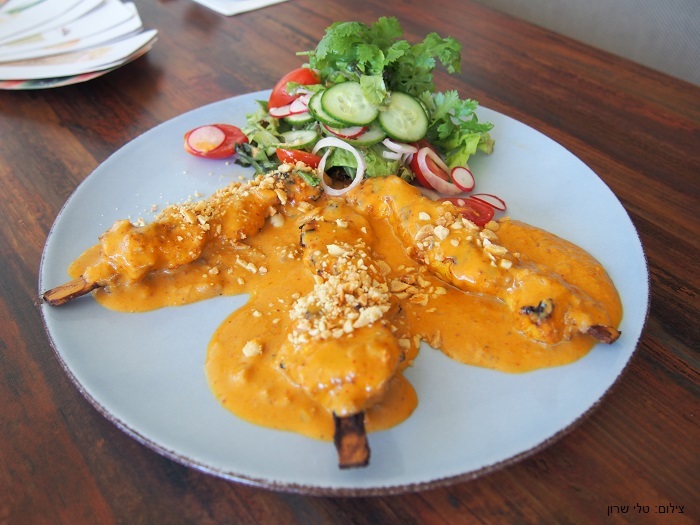 Gay Staa – Three chicken skewers in Thai curry sauce, peanuts and coconut milk, served with a small Thai Salad. Three medium sized skewers in heavy peanut butter curry, a bit spicy with a good amount of crushed peanuts. The salad was quite Israeli, but I found it refreshing, especially because I can’t handle spicy food very well. But the spiciness here was just right! 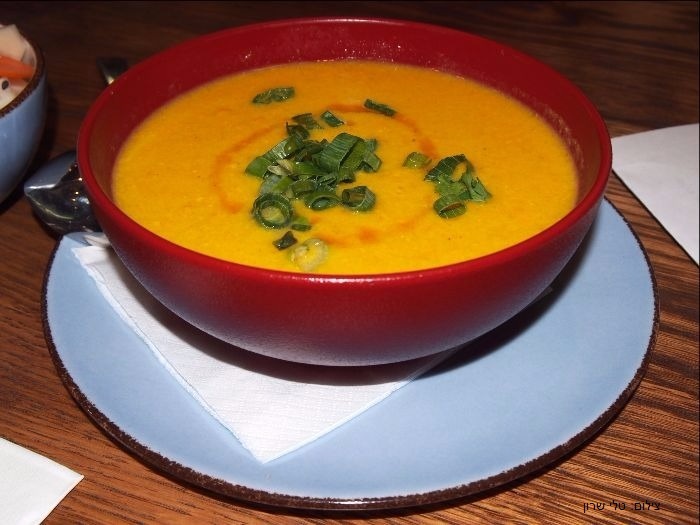 A somewhat different version of corn soup than we are used to, and I liked it – the soup was creamy and not clear, sweet and gently spicy, we enjoyed it! We order drinks, including beer. We got a plate of very tasty oriental pickles on the house. There are also cocktails, which we skipped as we don’t drink much during lunchtime. We ordered chicken and beef. 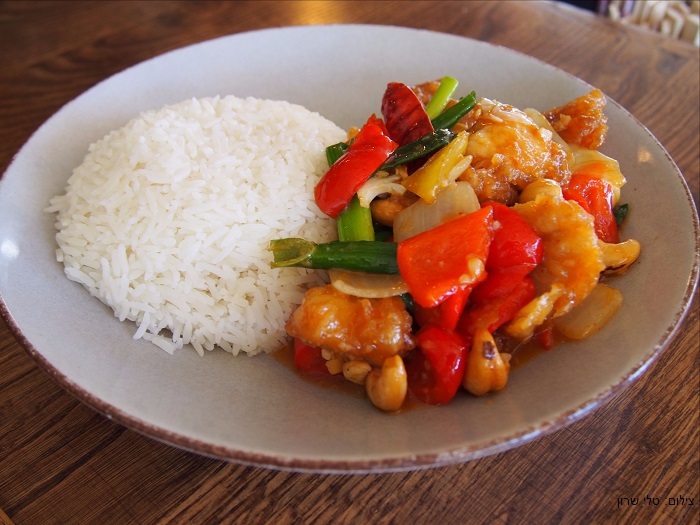 Khai Phat Met Mamuang – Chicken breast fried in tempura, with chili and clam sauce, bell peppers, onion, green onions, and cashews, served with steam rice. The chicken breast was very soft, the sauce a little bit sweet but balanced, and the amount of cashews was very generous, I enjoyed it very much! 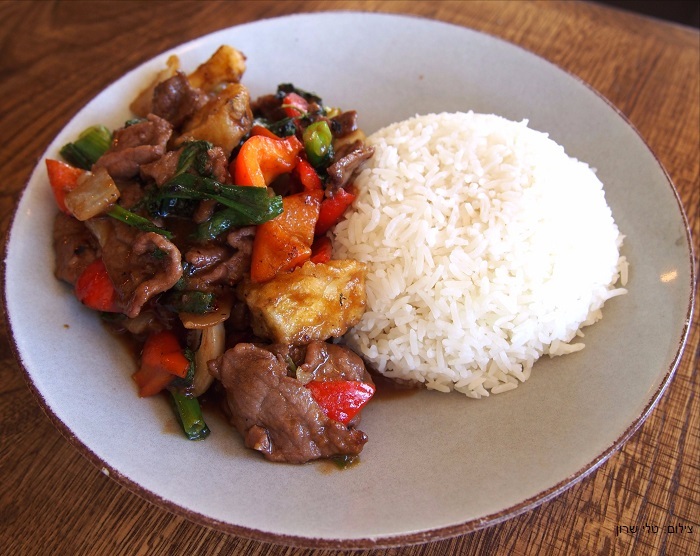 Neua Pad Pik Pauw – beef with chili, eggplant, onion and green onions, served with steamed rice. The beef here was so soft and yummy! 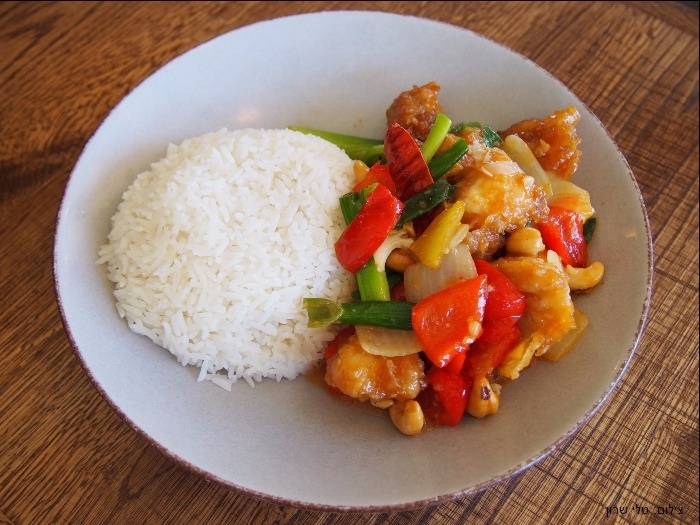 The vegetables included red peppers, onions and green onions like the chicken, but instead of cashews, there was eggplant (and some fresh spinach) and the sauce was entirely different than the chicken. A distinct different taste than the chicken. 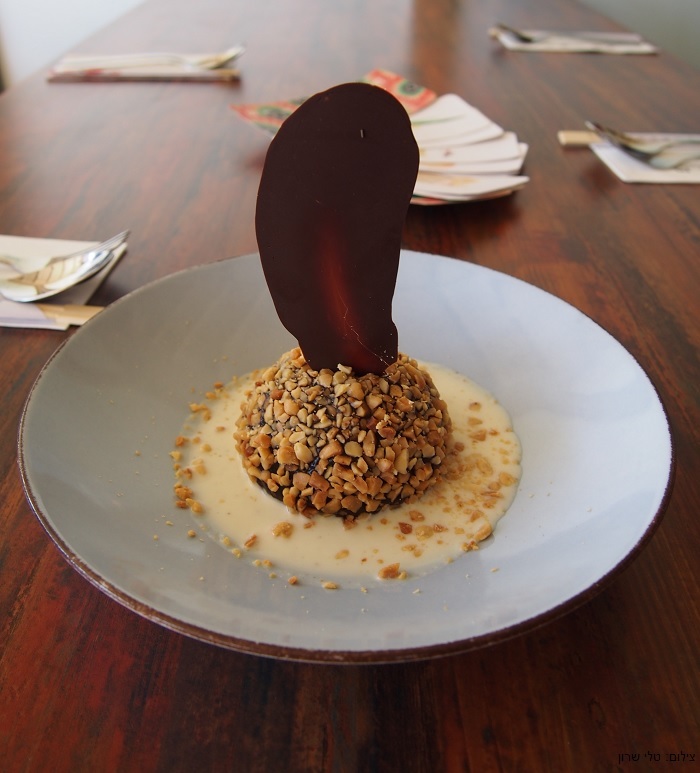 Peanut Butter Toffee Chocolate Mousse – Chocolate mousse covered with peanuts, vanilla sauce and chocolate temper. The name is a bit confusing as there is no peanut butter here, there are crushed peanuts only. This is a chocolate mousse with toffee inside. It is very heavy, sweet and tasty, although I prefer lighter desserts, especially after a full meal, it was tasty. The service at Irezumi was excellent, the waiter knew the menu very well and helped us choose the food, and made sure the table is clean and that we have enough napkins, toothpicks, etc. In summary, Irezumi serves high quality Asian food, and succeed in making each dish different. Irezumi, Yes Planet Rishon Lezion. Not Kosher. Prices are around 35 for starters, 60-70 for mains (premium plates are more expensive), desserts around 40. There are business lunch offers.